I intend to let go of my much-loved, preloved and brand new stuffs and share them with rightful and more deserving owners. I have lots of stuffs in my house and in my closet which lack the love that they deserve. I confess that I was an impulsive buyer back then who buys clothes and other things due to love at first sight, and subsequently realize that either I don't have an occasion to wear it, I don't want to wear it twice, it does not actually suit me or that I should not have really bought it considering that I have already too much similar stuffs in my wardrobe that I haven't worn! I am in a quest to find new owners for these pre-loved, much-loved and beloved stuffs of mine. I've finally decided to let go of a lot of my stuffs. These are my treasured items, and I really wish I can keep them all, but I am forced to pass these gems on to new owners due to personal reasons. I have been receiving a lot of emails from my readers asking me to sell or lend some of the clothes you've seen me wear and it had me thinking to start selling off my clothes to trim my wardrobe. I'm a very sentimental person and it is very hard for me to sell off my clothes and other stuffs, but I think it's the right time to do it. I have sold my pre-loved items before online few years back (I regretted selling my denim jacket, but that's another story), but I do not have the time to post pics of all my stuffs. 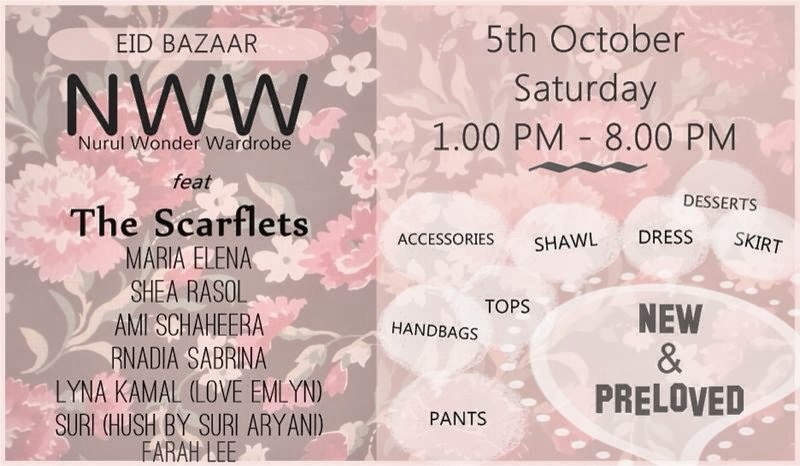 Mother of all coincidences, it just so happens that after I had thought of letting go all of my stuffs, and my family was planning a Big Yard Sale, I was recently invited to join the Scarflets at Nurul Wonder Wardrobe (NWW) for a mini bazaar. I'll be joining Nurul, Maria Elena, Shea Rasol, Ami Schaheera, Lyna Kamal, Suri Aryani and Farah Lee. 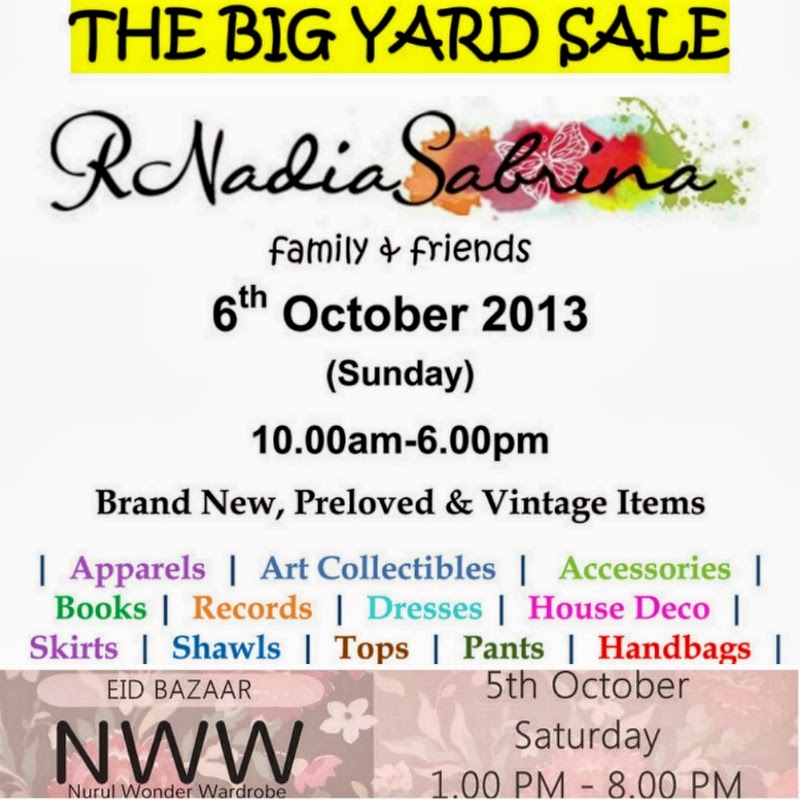 So, this Saturday I'll be bringing some of my apparels and accesories to NWW at Shah Alam. On Sunday, I'll be holding a Big Yard Sale in our yard from 10.00 am to 6.00 pm together with my family and with the help of some friends! We will be selling most of our brand new and preloved stuffs between 50-90% of the original price. We are letting go of a lot of our stuffs! Your negotiation skills will come in handy. I am also letting go of quite a lot of brand new items which I have never worn (with tags still on and some still in its boxes), and most items I've only worn once or twice and are in excellent conditions on the cheap. Other than all sizes and all kinds of apparels and accessories, there will be a lot of other items too, from books, magazines, music records, art collectibles, vintage items, art deco and everything under the sun. 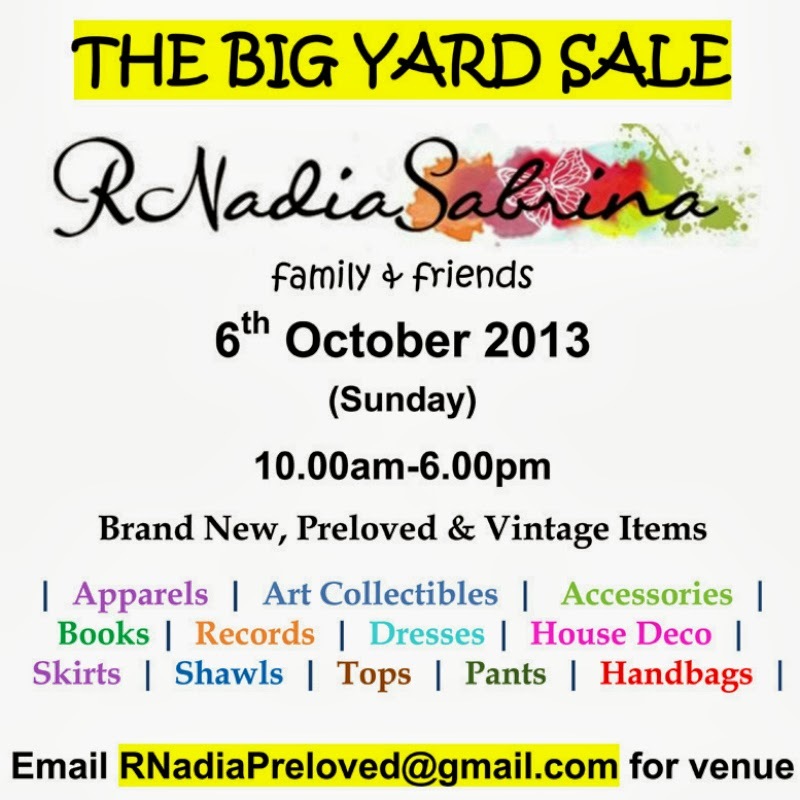 Please email RNadiaPreloved@gmail.com if you want to come so that I can email you the venue or address. The place is near the Intermark, KLCC and Ampwalk at Jalan Ampang, Kuala Lumpur. I'll be at NWW on the 5th (Saturday) and I'll be at the Big Yard Sale with family and friends on the 6th (Sunday) God-willing. It is hard to let go, but it is about time :) Thankful for the time that I've been blessed with temporarily owning the stuffs. Every single thing we "own" is borrowed to us anyways. I'm certain that you will find something that you will love to own at a fraction of the value! Really hope to see you there! Email me :) You will enjoy browsing and shopping! interesting. if only my size can fit urs.if not i will definitely go!